You can almost hear the theme song play as you gaze at this fantastic photo. Several stars from "The Office" gathered for what they called a "family reunion" on Sunday. But fans of beloved sitcom that wrapped up in 2013 are calling it something else — a reason to hope for more. "Some of the old gang got together today... it was so great to see everyone!" Angela Kinsey, who played Angela Martin on the series, wrote alongside a group photo of the fun. "I turned to Ed (Helms, aka Andy Bernard) and said, 'I feel like we are at a family reunion.” He smiled and said, 'We are.'" 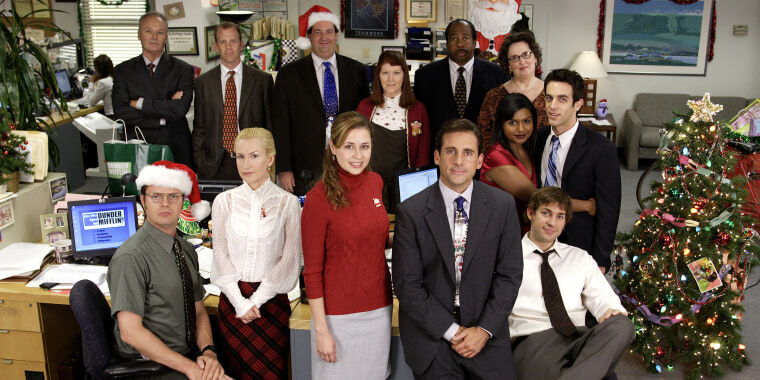 Pictured alongside Kinsey and Helms were Jenna Fischer (Pam Beesly), Rainn Wilson (Dwight Schrute), Oscar Nunez (Oscar Martinez), Leslie David Baker (Stanley Hudson), Brian Baumgartner (Kevin Malone), Paul Lieberstein (Toby Flenderson), Phyllis Smith (Phyllis Lapin), Creed Bratton (same) and showrunner Greg Daniels, who hosted brunch for the group at his home. Fischer shared her own shot from the day, and it brought back even more of the old Dunder Mifflin vibes. That photo featured the same cast members, but this time they were channeling their characters, too. From straight-faced Stanley to sad-sack Toby to the way-too-serious Dwight — it looked amazing ... and familiar. As Fischer explained in another tweet, the pose was an attempt to re-create one of their famous holiday office-party pics from the past (sans a few important players). Excited followers on social media celebrated with gifs, quotes and wild speculations about what it all meant. The most popular fan theory so far? A small-screen reunion must be on the way! While there's been plenty of buzz — even from the stars — about the possibility of such a thing, only time will tell if this brunch was really a precursor to that. But even if it's not, it's just good to see the gang back together again. Again. The brunch bash was actually the second recent "Office" reunion. The last one took place on the "Saturday Night Live" stage when Fischer, Helms and Ellie Kemper (Erin Hannon) greeted host Steve Carell (Michael Scott) during his monologue, where he shrugged off talk of a real prime-time reunion. "Why don't we just have a party instead?" Carell suggested. "You know, we can all catch up and get together — no cameras, just friends." "We already do that," Helms shot back. "We just don't invite you." That line earned big laughs, but as Fisher replied to one fan, who noted Carell's absence Sunday, "He was invited but he's in London!"